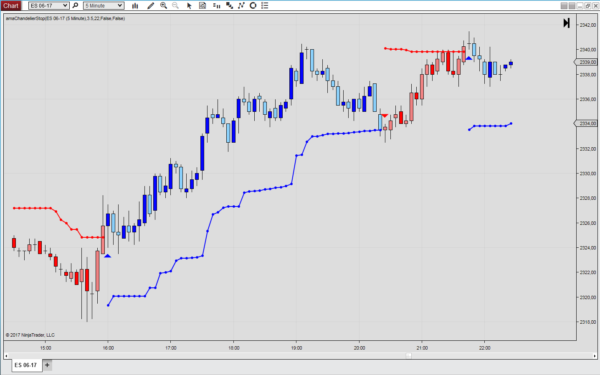 The Chandelier Stop is a trailing stop that adjusts according to the current market volatility. The indicator is also known as chandelier exit for trend following systems. Introduced by Charles LeBeau, one of the first system traders, the chandelier stops takes the highest high from your entry position and deducts a multiple of the average true range to calculate the stop loss. Subsequently, the exit is moved up proportionally whenever a new high is made. This version of the Chandelier Stop also comes with the Donchian Anchor. A long stop is then calculated by subtracting a multiple of the average true range (ATR) from the lowest high. A short stop using the Donchian Anchor is calculated by adding a multiple of the average true range from the highest low.